It was with excitement and intrigue that I literally sprang across Fox Studios at the Entertainment Quarter to attend LoveFest, one of the numerous line up of events held at the new A Sound Life Dome; a modern, sophisticated wellness centre, proceeds of which go towards delivering free yoga, music and meditation to those in need; hospitals, aged-care, women’s refuges, mental health and disability facilities. 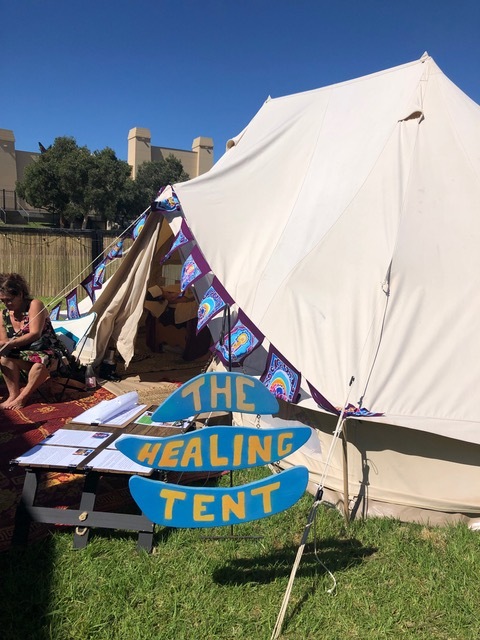 Normally there for the movies, farmers markets, coffee, bowling and restaurants, I wanted to find out just what the Australian charity A Sound Life had created in launching A Sound Life Dome. So fabulous is it from the outside, it’s like you’re walking towards a mini spaceship about to fly to another planet; that’s because it is an 18 metre multi-function geodesic structure, which I soon learn, has been created to maximise energy flow; a Rose Quartz crystal has been buried at the centre of the dome to ground the space and offer compassion, peace and healing. Which is exactly why it feels like another planet, because once entering the dome, the hectic concrete jungle of life is well and truly left behind. 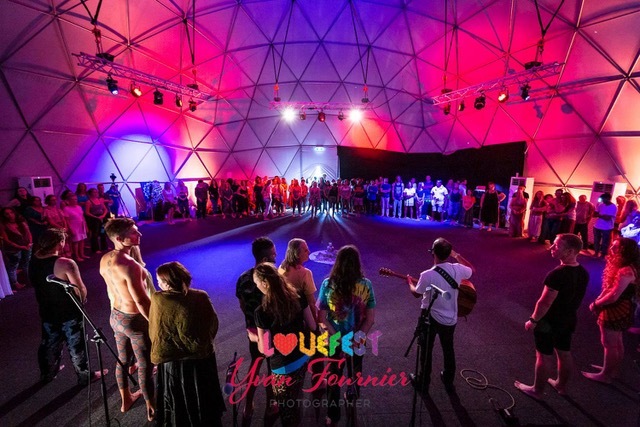 Events like LoveFest are a chance to let go of ‘Anxiety 2019’ and enter the beautiful world of nature, connection, the positivity of the human spirit, where you won’t meet one person with a mean bone in their body, and likeminded spirits wanting to simply get high on a drug and alcohol free life through mediation, music, chanting, yoga, art, massage, prayer, and of course nourishing clean food full of chai and tea elixirs and vegan dishes. With a roll of 20 seminars rotating inside the dome, and surrounding stalls, I customize my journey to my mood: I dance the kundalini as part of the Earth Element seminar, indulge in a cacao ceremony while experiencing the water element seminar, am mesmerized by the sounds of the multi-instrumentalists, in particular the flute in the Air seminar, sing impromptu heart felt lyrics in the singing seminar; explore Intuitive Body Painting; designs which reflect one’s energy: mine; ‘playfulness’, not to mention having the best Lomi Lomi Hawaiian massage of my life. 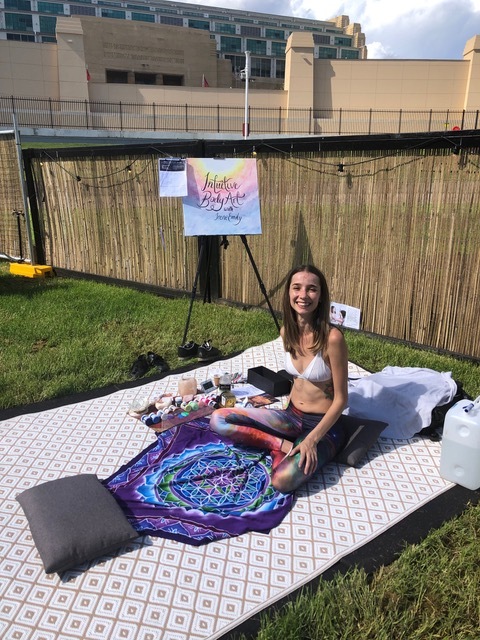 I pretty much floated home with a full heart and the knowledge that there are good people out there who want to experience a positive life and provide a unique space to do so. Founded by musician and yoga teacher, Edo Kahn and his late wife Jo Mall-Kahn in 2014; Kahn says: ‘Everyday wellbeing is a human right, yet millions of people can’t access it. The Dome is designed to transform lives, empower individuals and unite communities – not only by providing a space for people who work long hours and in a fast-pace society to feel calm and rejuvenated, but ultimately by helping to deliver thousands of magical moments to people who need them most’. 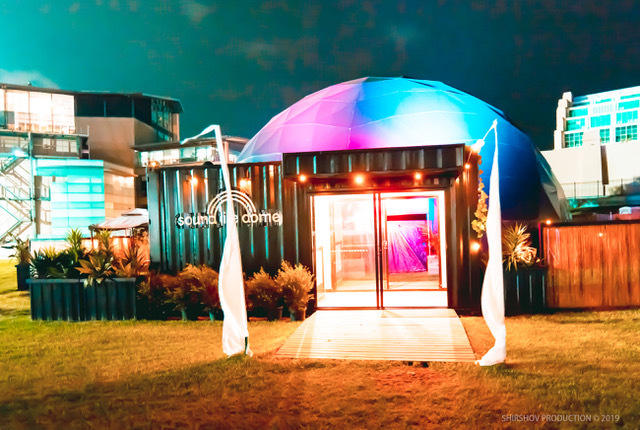 The Dome can also be hired for a range of events including conferences, product launches and award dinners, and corporate wellness programmes tailored for employees by the passionate team of A Sound Life professionals.